A technique to download remote fonts was first specified in the CSS2 specification, which introduced the @font-face rule. It was (and remains) controversial because using a remote font as part of a Web page allows the font to be freely downloaded. This could result in fonts being used against the terms of their license or illegally spread through the Web. TrueDoc (PFR), Embedded OpenType (EOT) and Web Open Font Format (WOFF) are formats designed to address these issues. When Internet Explorer 4 was introduced, font embedding employing EOT was used mainly for displaying characters in writing systems that are not supported by default fonts. Use on English-language Web sites was virtually non-existent. With the releases of Firefox 3.5, Opera 10 and Safari 3.1, usage employing other formats was expected to increase. TrueDoc, while not specifically a webfont specification, was the first standard for embedding fonts. It was developed by the type foundry Bitstream in 1994, and became natively supported in Netscape Navigator 4, in 1996. Due to open source license restrictions, with Netscape unable to release Bitstream's source code, native support for the technology ended when Netscape Navigator 6 was released. An ActiveX plugin was available to add support for TrueDov to Internet Explorer, but the technology had to compete against Microsoft's Embedded OpenType fonts, which had natively supported in their Internet Explorer browser since version 4.0. 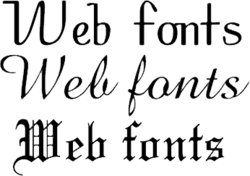 SVG fonts is a W3C standard of fonts using SVG graphic that is now a subset of OpenType fonts. This allows multicolor or animated fonts. It was first a subset of SVG 1.1 specifications The SVG fonts as independent format is supported by most browsers apart from IE and Firefox, and is deprecated in Chrome (and Chromium). That's now generally deprecated; the standard that most browser vendor agreed with is SVG font subset included in OpenType (and then WOFF superset, see below), called SVGOpenTypeFonts. Firefox has supported SVG OpenType since Firefox 26. All major browsers should comply soon. WOFF has been supported by Mozilla Firefox 3.6+, Google Chrome 5+, Opera Presto, and is supported by Internet Explorer 9 (since March 14, 2011). Support is available on Mac OS X Lion's Safari from release 5.1. Another technique is image replacement. This practice involves overlaying text with an image containing the same text written in the desired font. This is good for aesthetic purposes, but prevents text selection, increases bandwidth use, and is bad for search engine optimization. ↑ See Open-source typefaces and Free software Unicode typefaces listings for such fonts. ↑ Garaffa, Dave (2 September 1997). "Embedded Fonts In Microsoft IE4pr2". Internet.com. Archived from the original on 8 July 1998. ↑ Wubben, Mark (February 27, 2009). "Geek Meet: Web Typography and sIFR 3 - Slide 15 and 16". SlideShare. Retrieved 17 March 2010. ↑ Niederst, Jennifer (2001). Web design in a nutshell : a desktop quick reference (2nd ed.). O'Reilly. p. 36. ISBN 0-596-00196-7. Retrieved 20 March 2016. ↑ Irish, Paul (2010-01-25), Chrome and @font-face: It's here!